John Alban is a pioneer in Central Coast Rhone varietals and has been making Viognier for close to 20 years there. This wine is mostly sourced from his estate vineyards with about a third of the grapes being purchase from other Central Coast vineyards. 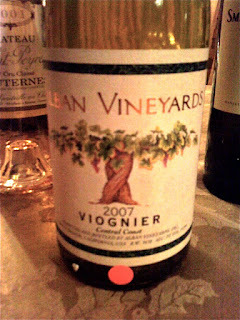 As to be expected with Viognier in general (especially in the case of Alban) this wine has amazing aromatics. I joked with some friends tasting with me that this wine could aptly be used as perfume if sprayed on. The floral aromas mixed with intense stone fruit, orange blossom, ginger, honey, and candied citrus make this wine a total blockbuster aromatically.